Rum Cottage makes a magical base for a winter break in the colourful West Highlands, near Arisaig. 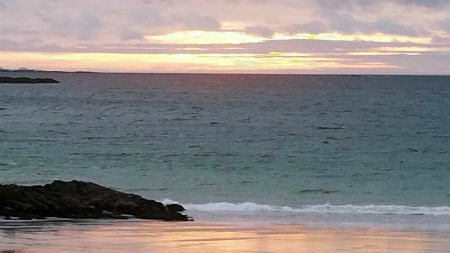 The beaches are quiet with wonderful sunsets reflecting in the wet sands, where dogs can run to their heart’s content. There are many walks in the area, of varying levels of challenge. The circular route in Mallaig climbs above the village giving great views to Skye and the Islands of Rum and Eigg, and looks down on the boats in the busy fishing and ferry harbour, and returns by the the old village of Mallaig Bheg, with views down Loch Nevis. We are only an hour away from Nevis Range Ski Centre above Fort William, and a bit further from the Glencoe Ski Resort, returning to the cosy cottage with its wood burning stove, at the end of an energetic day. Our scenic 9 hole golf course is playable all year round and we so often miss the worst of the weather which seem to pass on either side, deflected by the mountains of Rum and Skye. And of course January 25th is Burns Night, and Mallaig Swimming Pool are hosting a fundraising Burns Supper in the West Highland Hotel, with entertainment by local musicians including Gary Innes.